Those who have purchased recent boats may have noticed Hobie's latest Mirage Drive improvement -- a redesigned spine. Although the old version has been virtually trouble free over the years, several improvements mark the newest version. Perhaps the most noticeable change is the full length skirt. 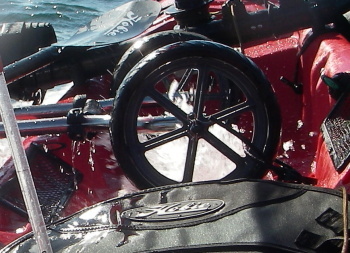 Hobie has attempted to mitigate fin-surge in the drivewell for some time, occasionally with undesired side effects. This seems to have solved the problem well. Keeping the surge out of the well makes the Drive run more efficiently. In this view, you can see the comprehensive coverage of the skirt vs the much smaller Drive Seal. This design increases the rigidity of the Drive as well. Note the skirt also incorporates an updated Drive alignment pin. From the front view, some of the smaller detail can be examined. 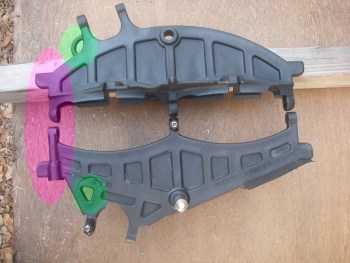 In this next view, the green highlight shows an example of the additional reinforcement for idler and sprocket shaft mounts (new spine on left). The red highlight area exemplifies below the waterline streamlining at the nose and tail of the spine. You'll also notice that something is missing -- there is no longer a provision for the pitot-tube speedometer. Evidently in these GPS days it has been deemed obsolete. I use my pitot-tube constantly and will miss having it available! This final picture shows the more robust profile shape. Again the streamlined shaft retainers can be compared, a more convenient location for the tether attachment (green highlight), and omission of the pitot-tube holder (red). Fitment dimensions are very close. The new spine extends the leading edge about 1/8" deeper for better fin clearance. Length is 1/8" shorter. I suppose this is to insure a better universal fit. In any event, it fits well and works flawlessly with my 2010 Adventure. The only modification necessary for older boats is to cut off the alignment pins. Overall, the new spine is a solid improvement. Well thought out, it incorporates several innovations. I especially like the streamlining and surge elimination. It's only shortcoming that I can see is the loss of pitot-tube capability. FWIW, the old spine is still in service and used with the inflatable series. Very informative post - thanks! In my personal experience the new drive fits the drive well poorly and results in a clunk, clunk, clunk, as you pedal. 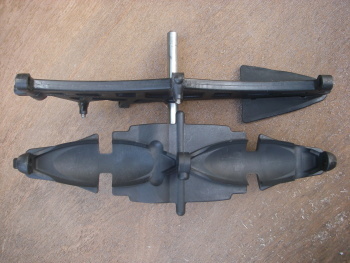 If the clunking is from the drive fitting loose in the drive well and rocking fore to aft that was also a problem encountered long ago on a few hull variances and the mirage drive. I believe several owners ended up using a small piece of vinyl tubing and used it to both cushion and shim the front tab of the drive. I think the goal many years ago was also to help prevent drive well cracking in boats like the Outback. I know also of some drive and hull combinations that fit too tightly that the fix was to shave off a little of either the forward or aft spine tabs. The plastic hulls and their slight variances in drive well size because of shrinkage while cooling makes "perfect" fits a near impossibility. I'm guessing the 1/8" smaller spine helps people get the drive in easier. Last edited by Yakaholic on Tue Jul 16, 2013 9:58 am, edited 1 time in total. I take it that with the new spine the rubber Drive Seal is not needed or can't be used? Safe to assume the 1/8" more depth to the leading edge reduces the "fin slap" on the hull we sometimes hear? I'm a little concerned about cutting off the alignment pin. Is the alignment pin not replaceable? Will a newer hull that uses the drive alignment pin have a problem with a pin cut off the spine? Finally do we have a part number for the new spine? Hopefully different from the old spine. I have a cracked spine at the sprocket shaft allen screw so might as well replace it with the new model spine. It is amazing how much water "surge" gets into the Island cockpit via the drive well when sailing and submarining. I have to believe the new spine will improve that situation. great post, as always, roadrunner. thank you. one additional question ... have you done any of your patented speed tests to see if you're getting a touch more efficiency off the new design? I don't think this is so much a fin slap matter per se, but a related occurrence. There are some combinations where the front sprocket can make contact with the drivewell rim at extreme angles, as shown here. Any additional depth would tend to minimize that tendency. I use my old Drives with my Revo 11 all the time. It has the pin slots and they have no pins. I've cut off the pins on the new skirt so it can used with my older boats. It works on everything. Frankly, if you know how to insert the Drive into the drivewell, the pins are superfluous. They were added just so inexperienced users couldn't insert the Drive wrong. All my Drives and drivewells are totally interchangeable. This brings up another point. On some of the earlier boats, it's conceivable that the skirt could be a tight fit because the Drive wasn't always perfectly straight in the well in those days. If that were to happen, a little file work on the skirt would cure the problem. With that in mind, the new spine should fit a 14 year old well. To answer your other question, the older spine pins are removable and replaceable -- they were were like an accessory. The new ones are molded in. Because they are now reinforced across the spine, they are less prone to flexing -- this makes them more idiot proof. (it was actually possible to mis-align the Drive even with the pins -- took talent though!). Don't know -- that's one for Hobie. ... have you done any of your patented speed tests to see if you're getting a touch more efficiency off the new design? That seems to be the case. My fast cruise pedaling speeds have increased by about 1/10 mph. This wouldn't necessarily be so much with slower cruise speeds -- the faster you go, the more important streamlining becomes. All of us who have launched with wheels still in the scuppers realize how little it takes to slow you down! So I think the reverse is true -- the smoother the bottom the better the glide. The empty drivewell turns into a big scoop, as shown with this Tandem Island. A skirtless Drive helps a lot, but a skirted Drive is even better. The more you can keep the slurp and surge out of the well, the less water you have to drag! Interesting. I have a new Revo 13 less than 2 months old and it did not come with the full skirt. I will have to compare which spine I have. Apparently the 2013 kayaks shipped with a mix of drives. My dealer said it was a crap shoot which drive was in with the kayak when he opened it. I got the new one. The alignment pin is removable and does not have to be cut off for incompatible models. Simply rotate it with pliers and drive out with a hammer. The alignment pin is not compatible with the i9s as far as I can tell, perhaps this is the case for all the inflatables and their one piece mounts. The alignment pin is removable and does not have to be cut off for incompatible models. Simply rotate it with pliers and drive out with a hammer. That's true -- for Drives with non-skirted spines. A close examination of the first picture shows the older spine with pin removed and skirted spine with pin molded in the skirt. These earlier spines may still be shipping with inflatables -- they use a slightly different drivewell which may not fit the skirt. .
Its interesting that this thread got bumped after 6 months, around the same time as I discovered the difference by accident this weekend. I have two 2013 models, my Revo11 was shipped in January '13 and my Outback was a 2013 year-end clearance model. I grabbed the "wrong" drive and put the newer drive in the Revo and it performed so much better than normal! My older drive makes a clunking sound when I reach full extension on the pedal, but the new drive did not. I previously thought the sprocket needed to be changed, but now I think there is more that I should look into replacing. Who knows the part number of the old spine/drive? (the old, with the venturi velocimeter hole).